Think about the last time you had a really good laugh, where you couldn’t breathe, your stomach hurt, and your face felt like it was stuck in smile mode. I bet it felt wonderful right? Now think about when you have been upset in some way, and it was one of those moods where you just didn;t feel like laughing, but then someone punched through that anti-happy wall and cracked you up. That laugh made you feel better didn’t it, at least for a moment? Laughter equals happiness and an amazing thing happens during this great happiness; you forget about the negative in your life and just smile. With all that being said we can definitely say that laughter is the best medicine. People love humor; the most popular form of entertainment is comedy. 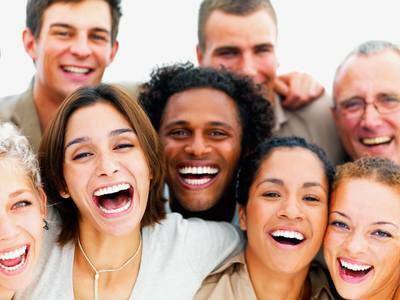 Humor is used in hospitals and senior care facilities to fill people with joy all of the time. When we are around babies and children the first thing most people do is to try to make them laugh or smile right? Humor is even used to help in awkward situations, such as meeting your boyfriend’s parents for the first time, trying to make friends at a new school, or trying to break the ice at a doctor’s visit. When there is laughter and smiling faces around it emanates a feeling of comfort. Feeling comfortable is a desired feeling by everyone and the people that don’t physically have that luxury all of the time can at least catch a glimpse of it in a laugh. Now do you agree that laughter is the best medicine? I never thought you disagreed but I wanted to give you some great examples of the true power of laughter just to make sure you were completely convinced. Just being positive in general has a fantastic effect on your mental health which works right alongside with your physical health. With that being said, don’t forget that laughter is the best medicine, so go medicate!